A short and relatively gentle tour, providing an overall impression of the land, the people and the history of the last independent Buddhist Kingdom. One of the most remarkable aspects of the country is in its overall degree of separation from the outer world. During this brief stay you will witness many of Bhutan’s defining characteristics and fascinating contrasts. It is both immensely refreshing and stimulating to find oneself in a situation so different from the familiar. 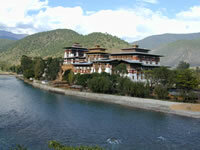 The trip covers the highlights of western Bhutan: Paro, Thimphu and Punakha. Paro is one of the holiest and most fertile places in the country. The lower valley of Punakha possesses an immense historical significance. As you hike through the surrounding countryside, visiting temples and passing through traditional village settlements, it is clear that both maintain the overall ambiance and tranquility of earlier times. Thimphu is Bhutan’s capital city and the hub of modern influence. Here you can observe how the country is seeking to merge new practices within its rich traditions.